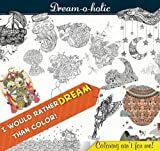 Coloring, that the stargazer would not dream of, becomes the stuff of his dreams in the pages of this book of mindful coloring. Pattern after pattern unravel the threads of his imagination and lead him through the maze of his mind. He dreams as he colors and in the process colors his dreams.